Testing. Is there any process that strikes more fear in the hearts of the average Joe? Certifications for your job, driver’s license, medical checkups; there isn’t a lot of testing that occurs with a smile on your face. Well, not in most cases. Celina’s testing lab, located at our main Celina, Ohio facility, allows us to test the materials and hardware that we source to ensure the best quality product is passing through our doors. We check for things like consistent material weight, UV resistance of treated fabrics, and do more long-term tests to see how metal coatings and various fittings stand up to weathering of all types. What does this all boil down to? Destroying stuff! Because we need to find the limit to our products’ tolerances, much of the testing is destructive to the testing piece. This makes out testing process just that much more fun in the long run. Our lab contains so many different types of testing machines that to list them all in a single blog post would be foolish. For the moment, we’re going to cover just a few of the more important tests we run on a regular basis. While not the most creative name (lab techs weren’t fond of “Sodium Chloride Degradation Chamber”), the Salt Water Sprayer is a sealed chamber that increases salt and humidity levels on the inside, exposing any materials or hardware hung within to the equivalent of many, many days of tent installation by the sea. Salt water is notorious for quickly breaking down metal – using the Salt Sprayer gives us the ability to check any protective coatings for their ability to resist corrosion. As far as names go, this one is pretty good. Because no two people have the same strength (or gauge of their own strength), the ability and amount of force required to tear an object is difficult to check without relatively specialized equipment. The ETT allows you check the amount of force required to tear the sample piece in whichever direction the tear is started. Fire can be one of the most destructive things to occur in a tent. Since most tents are made from fabric, which is classically very flammable, tenting regulations require that tents used to house people at any point are treated with flame retardant chemicals. As detailed in other blogs and videos we’ve made, the Flammability Chamber allows us to test the flame resistance of the fabrics we use by setting pieces on fire. No matter what product we’re making, all materials that come into Celina’s main facility are tested to ensure that every item we make is of the highest quality from the start. 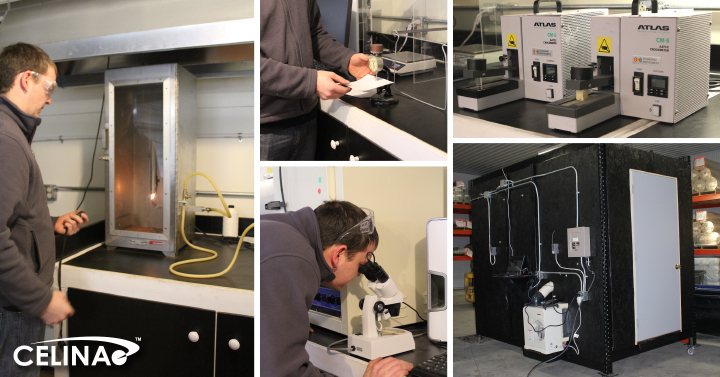 If you want to find out more of the testing we do to keep our products the best they can be, head on over to our Material Sourcing > Quality Assurance Lab page for a more complete run down of the various instruments we use. As always, you can send any questions you have (about this or any other topic) to us at sales@celinaindustries.com. Older PostPop Up Tents for You, Animals – Everyone!